The Force10™ is a full face twin cartridge mask with Class 3 heavy duty filter connections. The.. 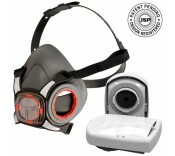 The Force8™ twin cartridge half mask with Typhoon™ valve offers superior low breathing resistance.. Cost effective filters for protection against particulates with low profile angle for minimum vis..
With the new Force8™ PressToCheck™ filter you can instantly check that you have the correct seal ..